Growing up as a huge Boston Red Sox fan, with Roger Clemens as his idol, 22 year old Johnny Barbato may not have foreseen the day where he would be traded to the New York Yankees. However, the former sixth round pick out of high school in 2010 is looking forward to being a member of the storied franchise. 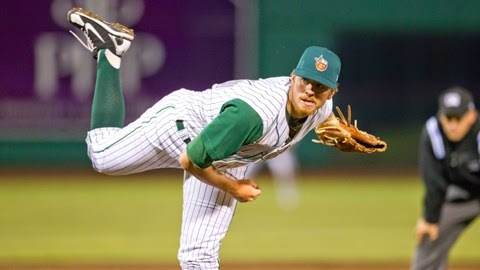 Recently acquired from the San Diego Padres for right-hander Shawn Kelley on Dec. 29, the right-handed prospect Barbato appears to be on track toward dawning pinstripes very soon. Barbato was able to turn in a 2-2 record with a 2.87 ERA converting 16 out of 18 save opportunities with the San Antonio Missions in 2014, a Double-A affiliate of the San Diego Padres. Barbato was well on his way towards a great season before suffering from elbow problems and missing the second half of the season. With much speculation surrounding the severity of his injury, Barbato stands by the fact that he thinks he can avoid Tommy John Surgery. After playing catch and throwing an inning in October, Barbato believes he will be good to go by the start of the 2015 season. Barbato was able to talk to us at the Bronx Bomber Blog and we asked him quite a few questions. Here’s the conversation we had with him, enjoy! The fastball, curveball and change-up relief pitcher could land in the Bronx in the near future. He is currently on the Double-A affiliate of the Yankees, the Trenton Thunder’s roster and will be a major bullpen piece for them. Johnny, we here at the BBB wish you the best of luck in the future and really appreciate you joining us for the interview! Excellent job getting Barbato to join you for an interview! Good potential, hope he pans out.